Back in the late 80's and 90's I was the Head of IT at Didcot Girls' School in Oxfordshire. The department was set up in 1985 with a small network of just 12 computers. I took over the following year and within a few years IT was being taught as specific timetabled lessons to all pupils in every year group as well as through other subjects across the curriculum. In 1986 we were one of the very few schools (against later government dictate) to start teaching IT as a separate subject throughout all year groups. In 1996 we were one of the very first schools in the country, or world even, to have it's own website. 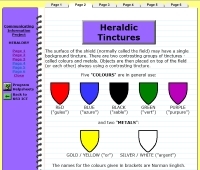 This I wrote entirely in self-taught html code from scratch and I was particular keen on transferring all my constantly photocopied teaching material onto it for pupils to use both during and outside of their lessons. As IT/ICT was a brand new subject for many schools the website quickly became a recognised source of teaching material throughout the world. See the responses I got to an online revision quiz. By 1998 the school network contained about 600 computers and linked all 3 buildings via optic fibre. The internet also became a major source of mutual help for IT technicians throughout the country, some expert and many keen novices trying to get to grips with this new technology in schools. In 1999 in recognition of my various contributions, the major educational supplier, Research Machines, provided me with an additional website - dgsoxon.org.uk/download, which surprisingly is still up and running, although now totally out of date. The school website remained until I retired at the end of 2011. It was totally replaced during that year (and not before time I might add!) 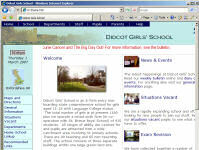 with the bespoke, more modern, online editable, and professional system that is there now - didcotgirls.oxon.sch.uk. All my work was lost from the internet, so now 5 years later I have decided to dig out a copy that I found still on my computer at home and put some of it here for posterity. Brief History of Didcot Girls' School - this was given to me one day by a long-serving school secretary and possibly now unrecorded and otherwise lost forever. Alumnae of Didcot Girls' School - a little idea of mine back in the day, which gained some good results. Again, it seems a shame to lose it. Heraldry Project - a project in communications of which I am particularly fond as it took something historical and brought it up to date. From the ancient art of heraldry to company logos and business letters or cards. I think I gave this to Year 9 pupils. Data Handling Project - a project involving setting up and analyzing a database consisting of the results of a survey. The survey was on the computer experience of pupils entering Year 7 from about 30 different primary schools in 1991. This was used as part of Year 10 GCSE coursework. Word Processing Course - this first started on paper as an adult evening class I did back in the 1980's when typewriters were slowly being replaced by word processors. It then became part of the RSA Computer Literacy and Information Technology (CLAIT) course that we offered to Years 10/11 and Sixth Form (later replaced by GCSE in 1986-88). It also became part of Year 7 coursework. Program Help Sheets - for Word, Excel, etc - first made available on paper near every computer. Once on the internet and with computers spread across the school these could be used throughout the curriculum. Work Guidelines - how to write a formal address and telephone number correctly for a business letter or card. Guidance on writing reports and questionnaires. GCSE ICT Revision Notes - notes on Hardware, Software, Security, Health & Safety, Applications & Effects. GCSE ICT Homework - question sheets on Hardware & Software, Data Handling & Storage, Modelling, Control, and Data-Logging..
Digital Brain IT KS4 Power Station - this was something I was commissioned to do privately by an online learning company. 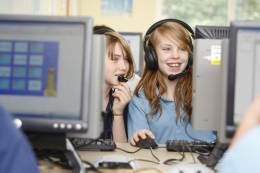 It was taken up by some county education authorities but soon superseded by other learning platforms.